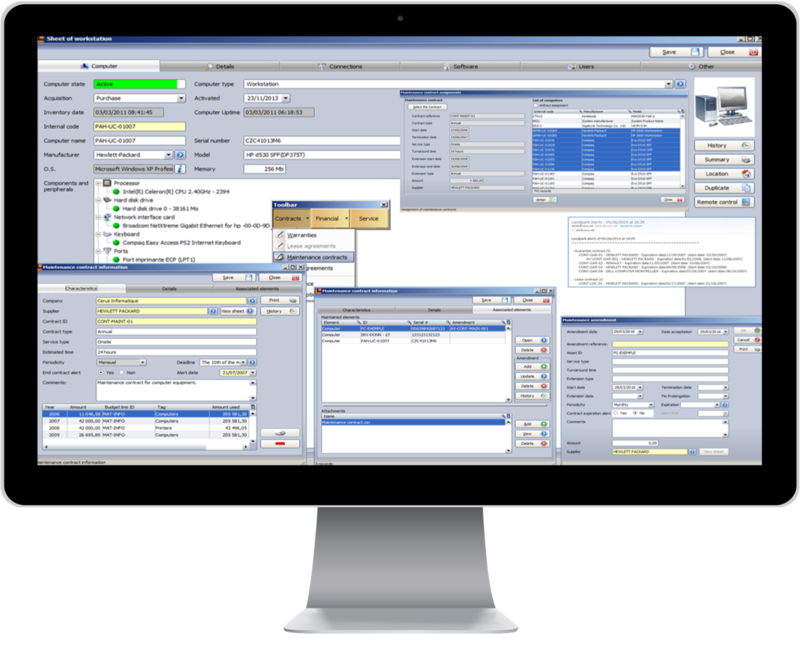 Professional IT Assets Management Software for a fast exploitation and management of your IT assets (ITAM and SAM), Landpark Manager offers you a powerful and professional tool for an optimal management of your data processing systems (700.000 installed licenses). Effective management of your IT assets has now become a strategic requirement. Landpark Manager adapts itself to companies' needs - regardless of their size or structure - to ensure that the IT Manager controls its computer assets and to assist him in decision-making. 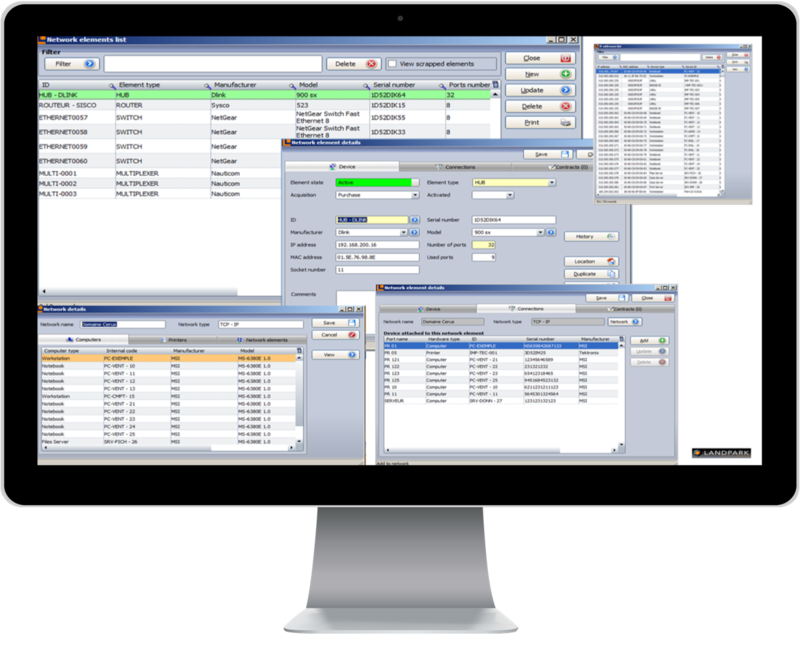 Landpark Manager enables you to effectively manage your entire data processing systems (hardware and software) and ensures you a perfect economic control. 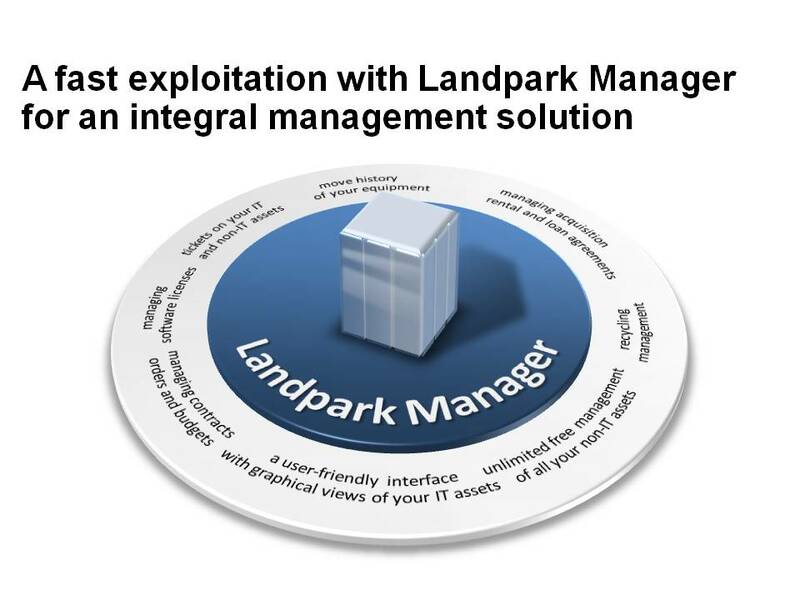 Landpark Manager is your professional supervision tool for better control of IT assets. 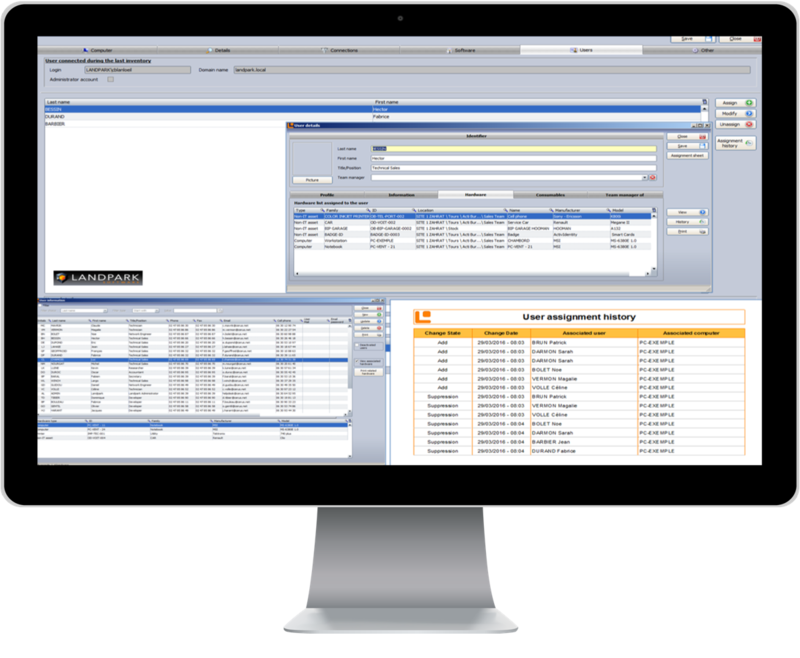 Its features make it the ideal tool able to help you more each day for better management. 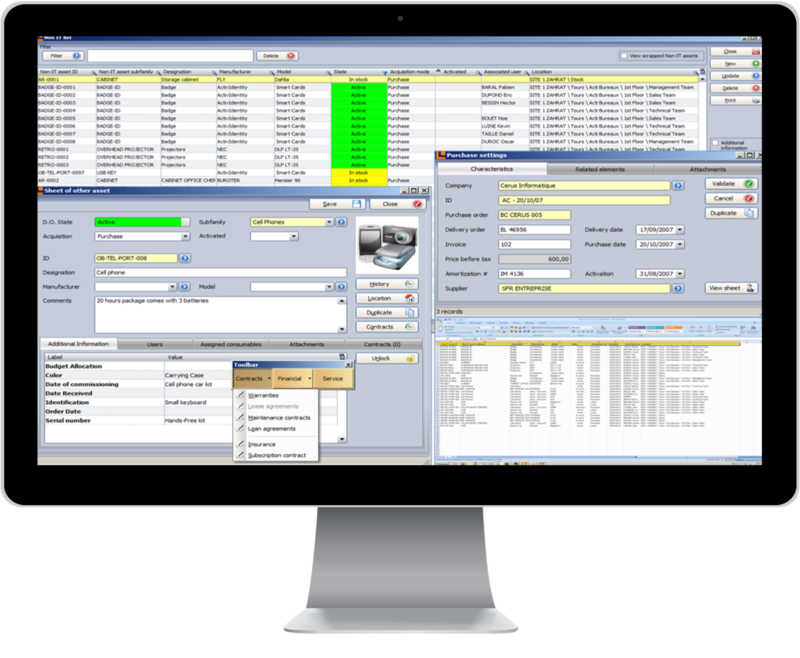 Landpark Manager is a complete software, with convivial ergonomics “tree view”, making it possible to ensure the complete cycle of management of your data-processing equipment. 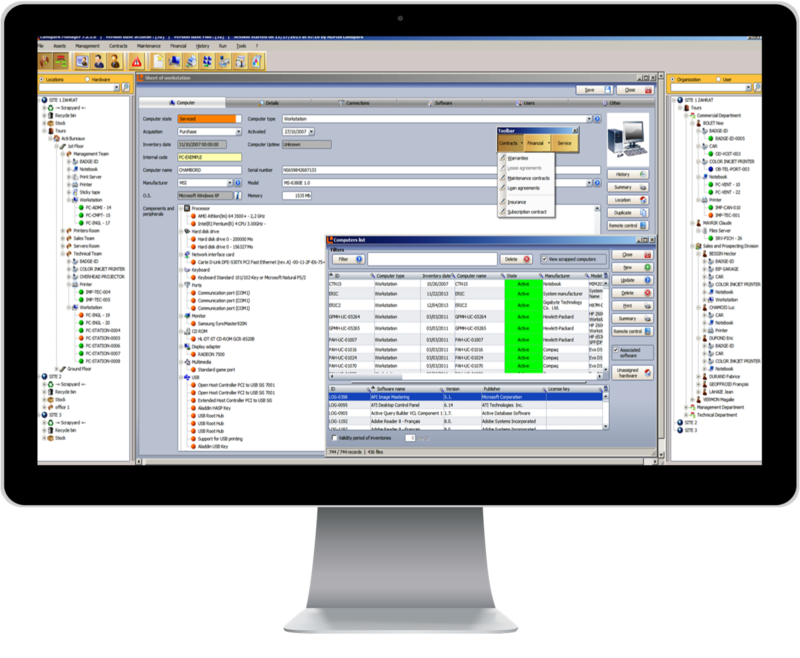 Its Helpdesk module will enable you to manage incidents of any nature. 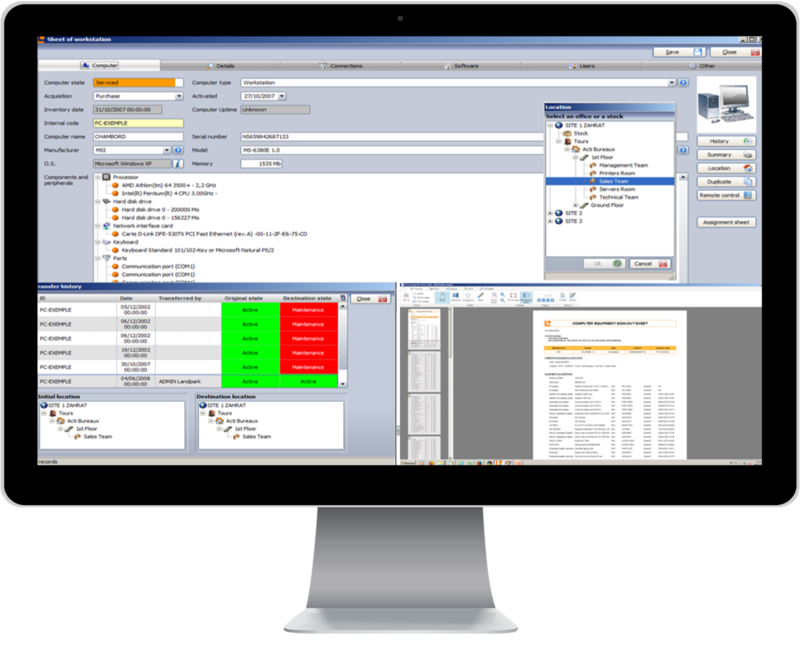 A user-friendly interface with graphical views of your IT assets. 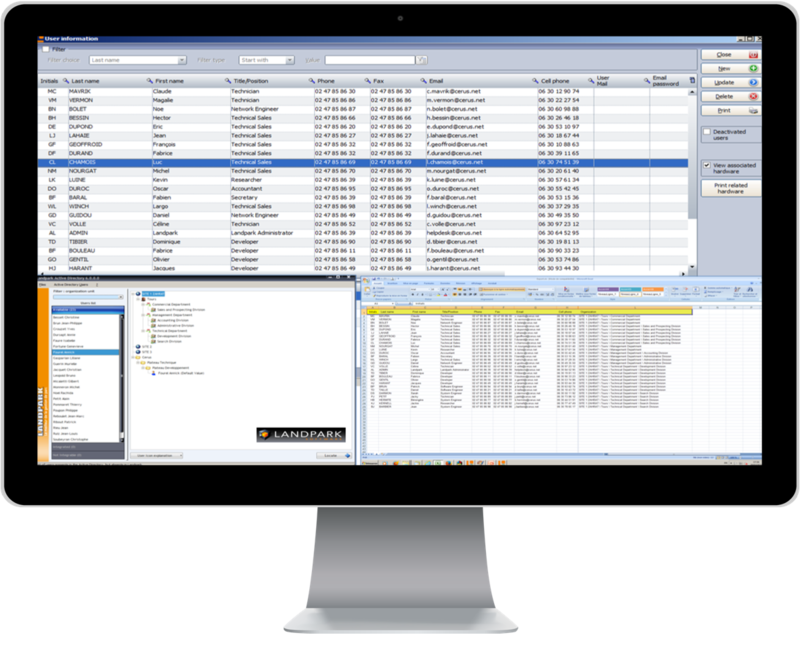 Immediate and easy access to information and features. 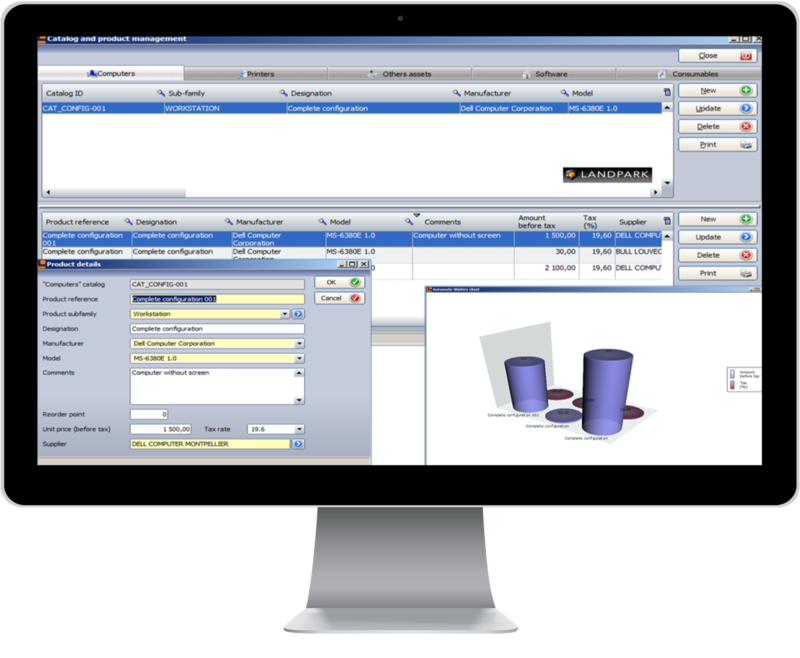 Click on the image Quickly manage your IT assets and Non-IT assets via a context-sensitive toolbar. 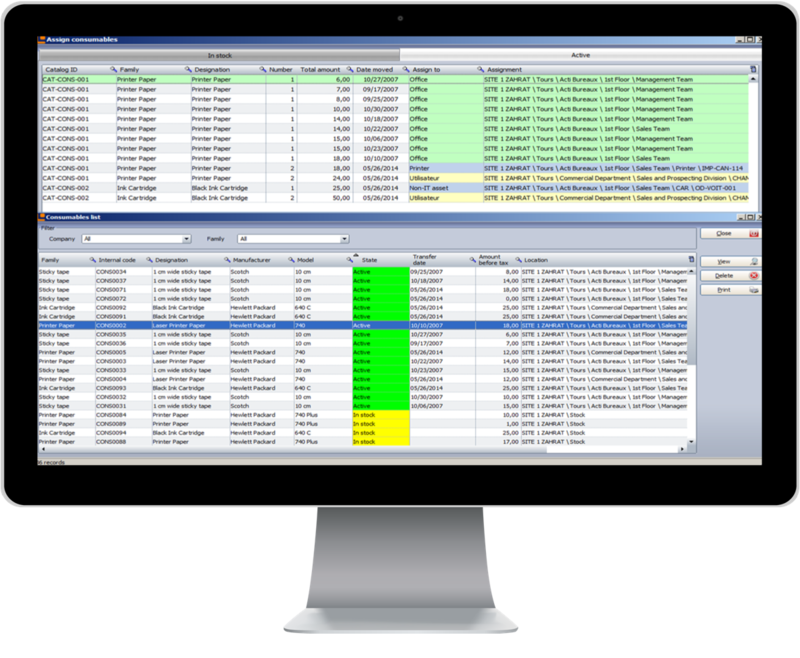 High availability of information on each of your assets. Print out a complete signable summary that describes currently allocated hardware. 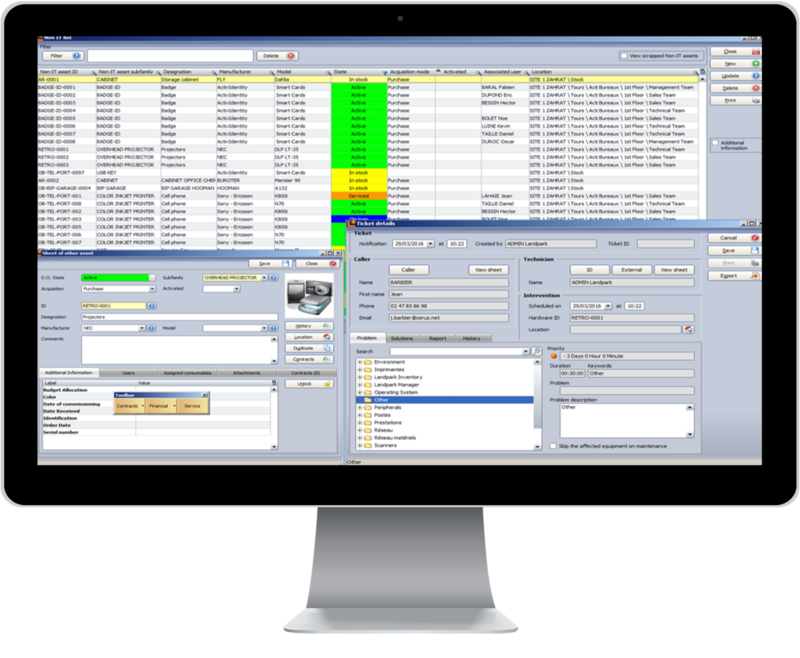 Managing move history of your equipment. Move history and items by location. How to import your users list. 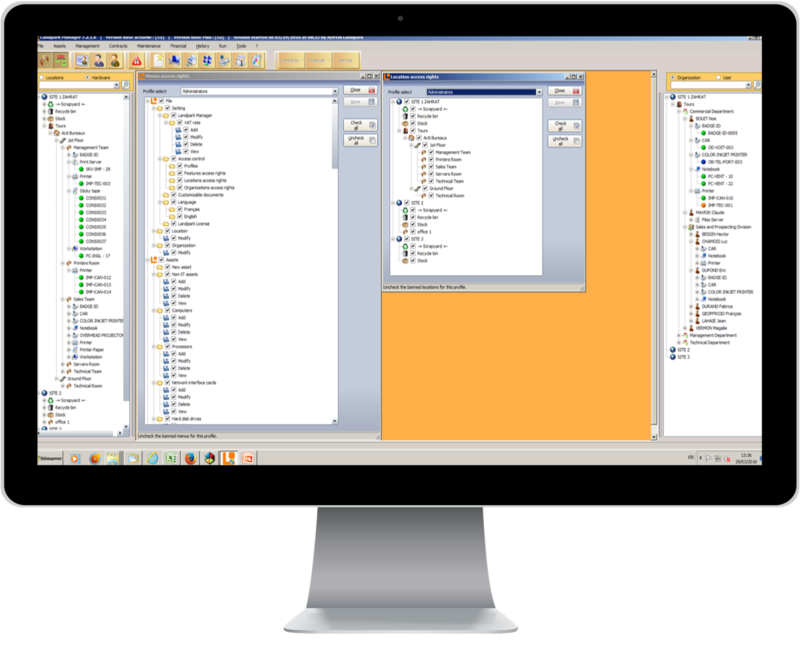 Users are imported from Active Directory / OpenLDAP or from an Excel spreadsheet. 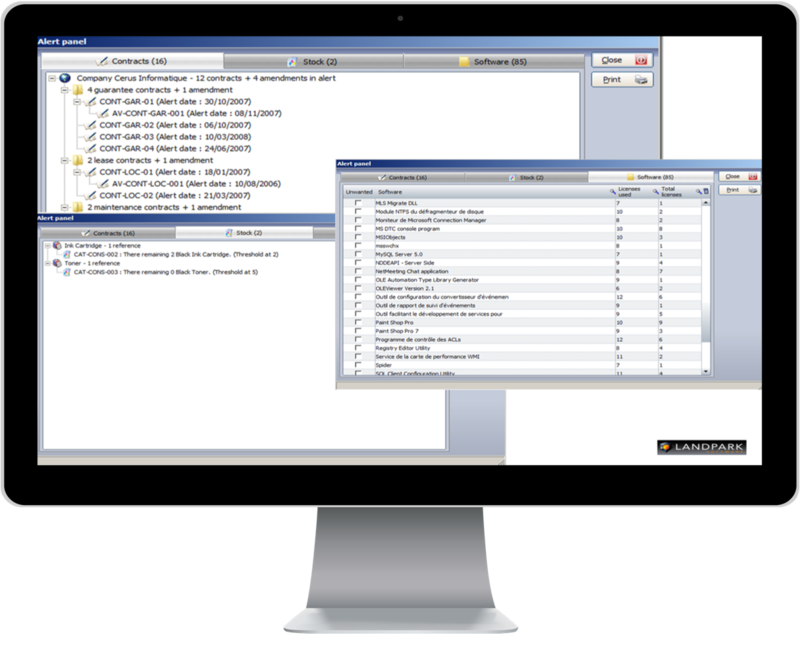 PC list associated with software licenses. 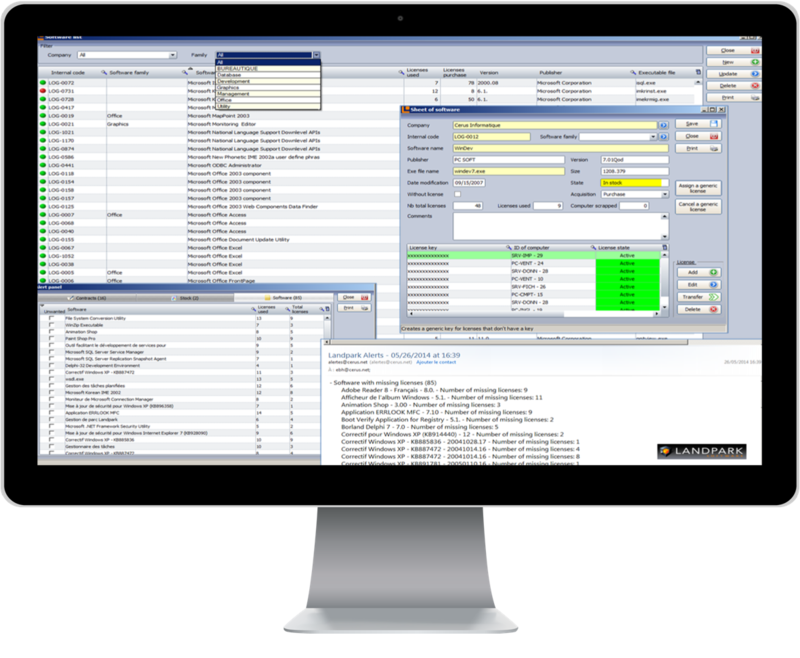 Modify the software reference list, add your own applications or detect unwanted software. Find any application that is not registered in your software reference list. 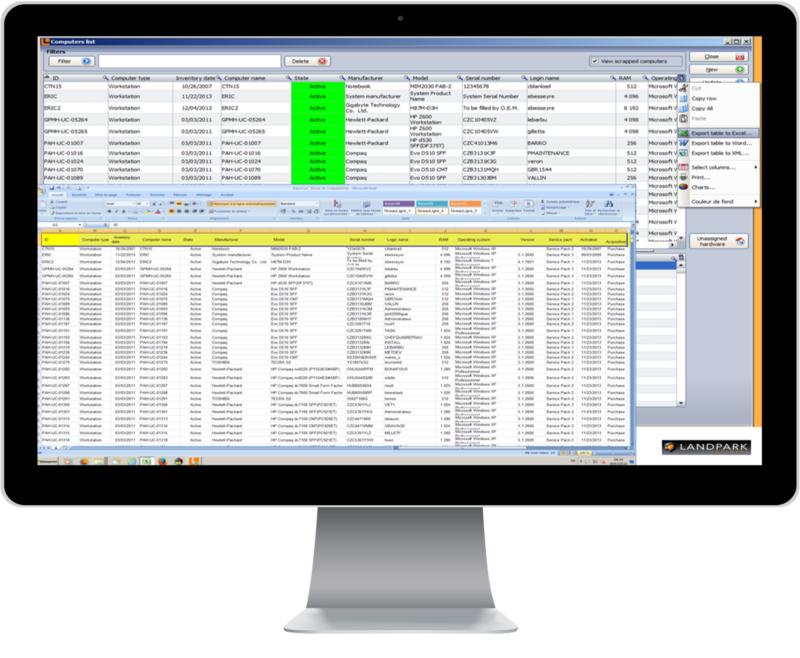 Export all your IT item or non-IT item lists (Excel, Word, Xml, Html, PDF, Email PDF). 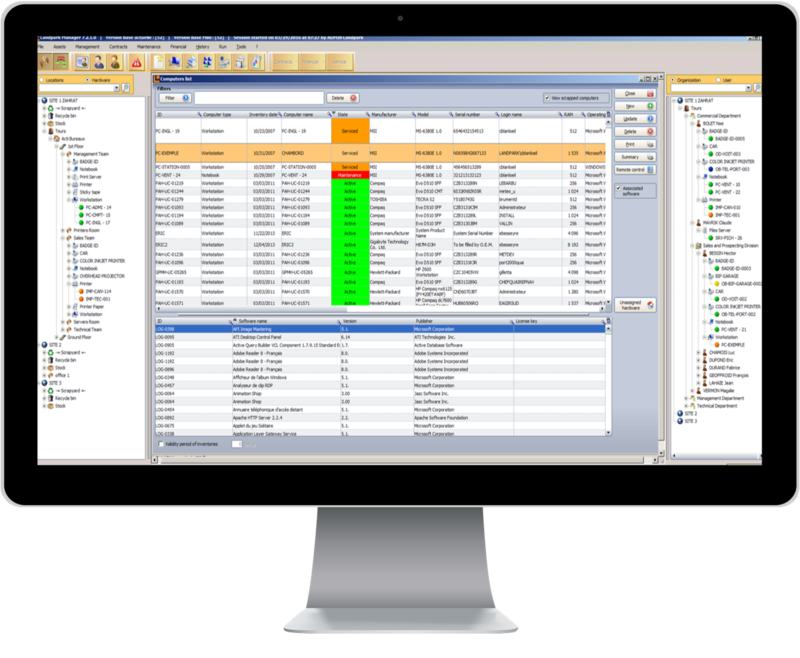 Included reports can be exported to EXCEL, WORD, XML, HTML, PDF, Email PDF. 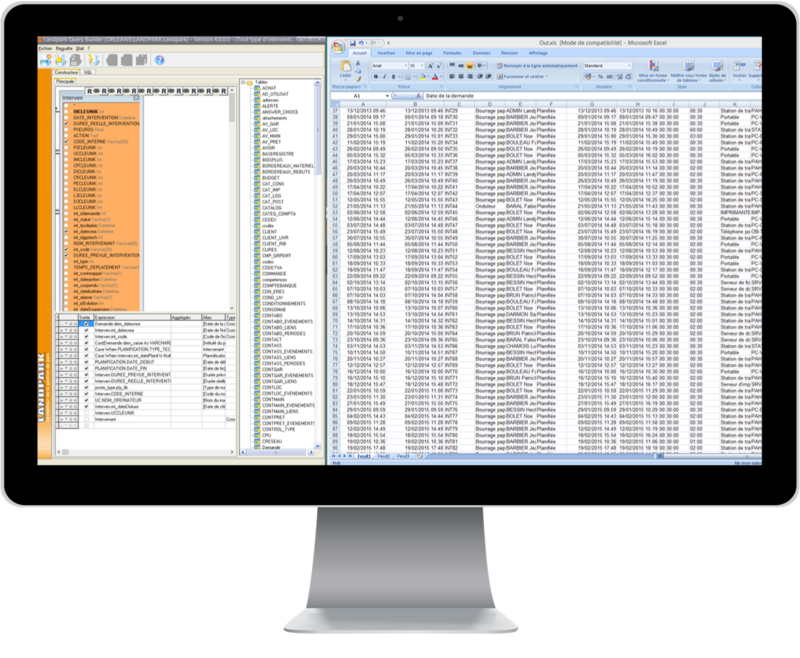 Predefined queries on standard RDBMS (SQL Server and Oracle) with export to Excel. Quick overview of your queries. Managing your acquisition or rental settings. Buying, renting, leasing, loan, etc. Financing options on an item. 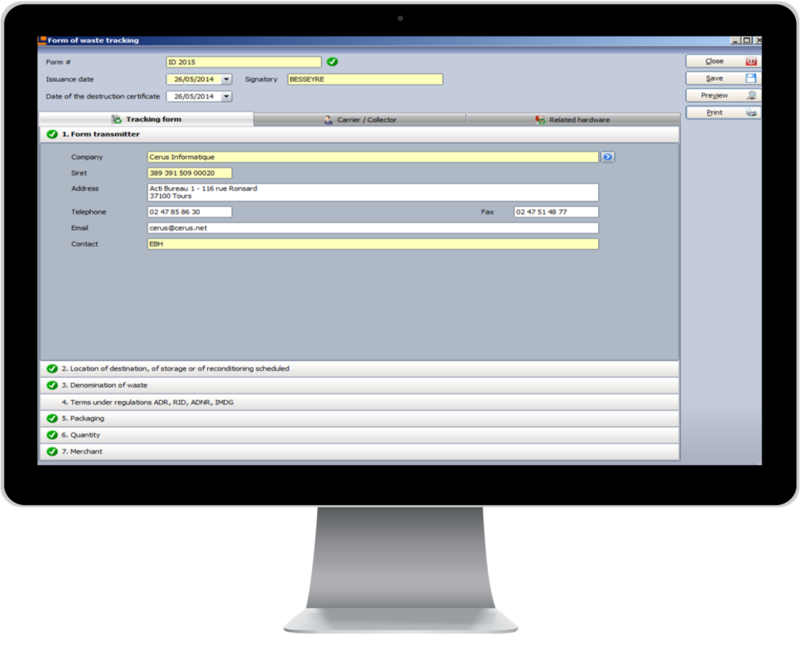 Create alerts on expired contracts sent by email. Managing your loan agreements, insurance contracts and subscription agreements. 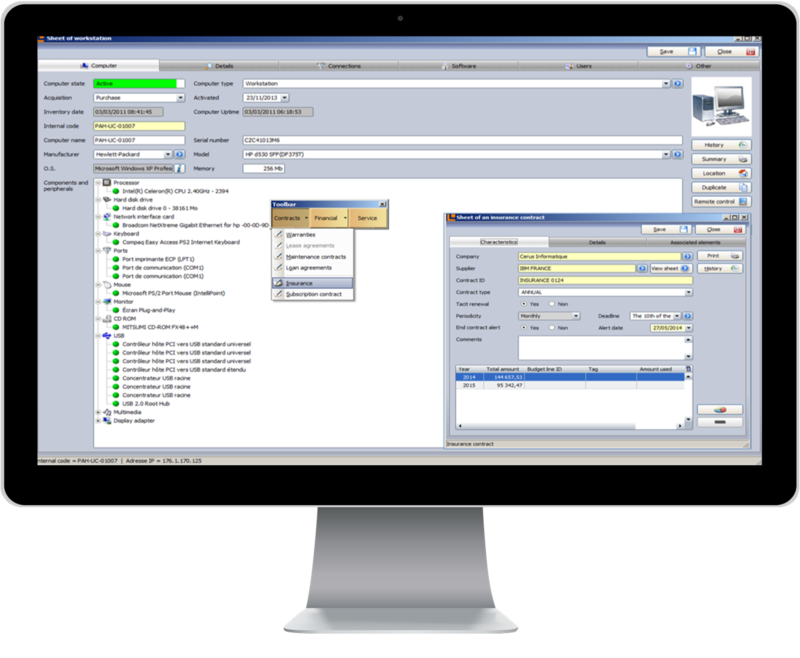 Automatic assignment of the same contract parameters to multiple items. 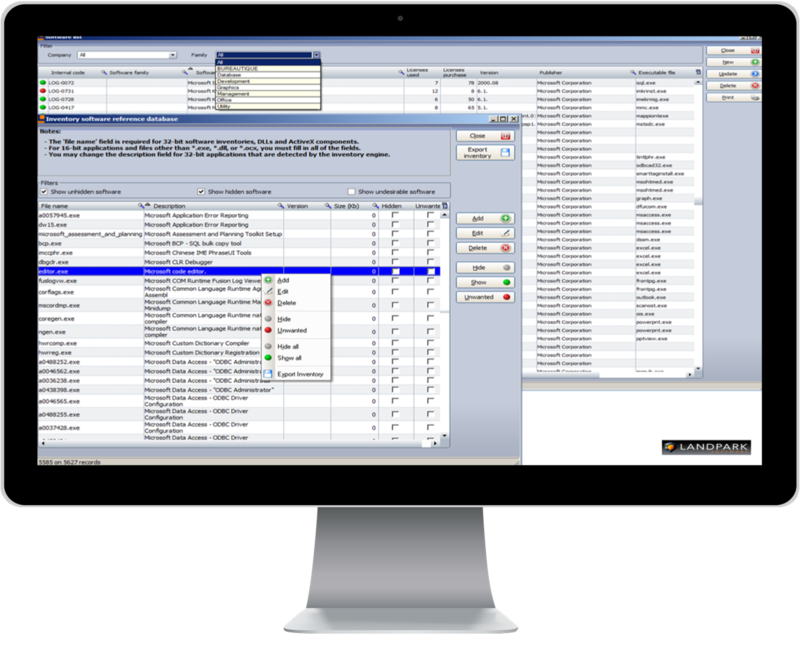 Create alerts on expired contracts/agreements sent by email. 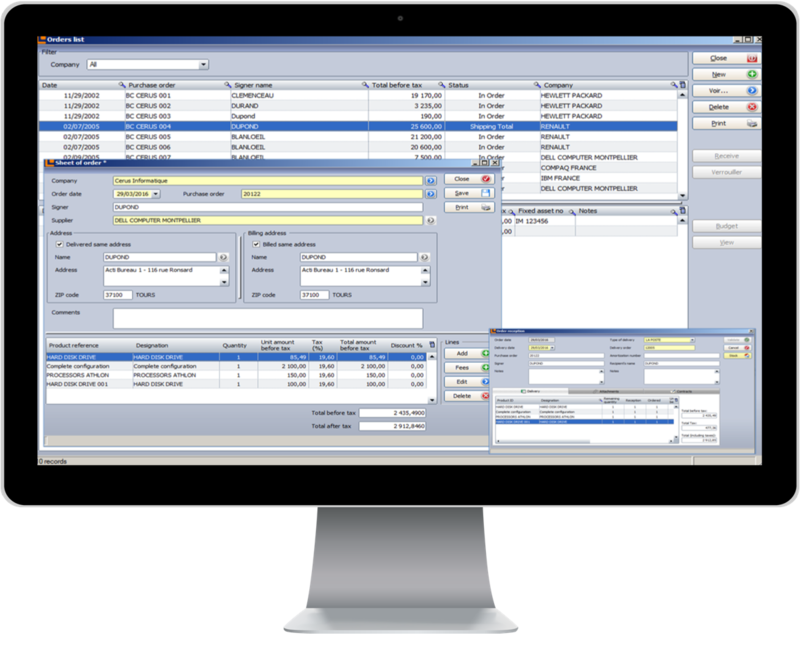 Managing orders and purchase requests. 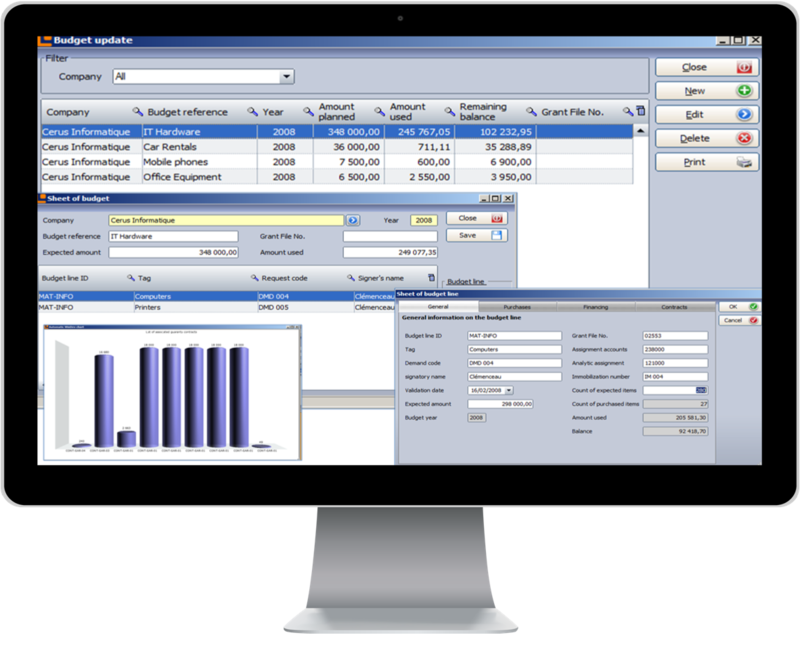 Managing your budget and budget lines. Assignment of purchases to budget lines. Alerts on consumables reaching the reorder threshold. List of entries in the supplier catalog. 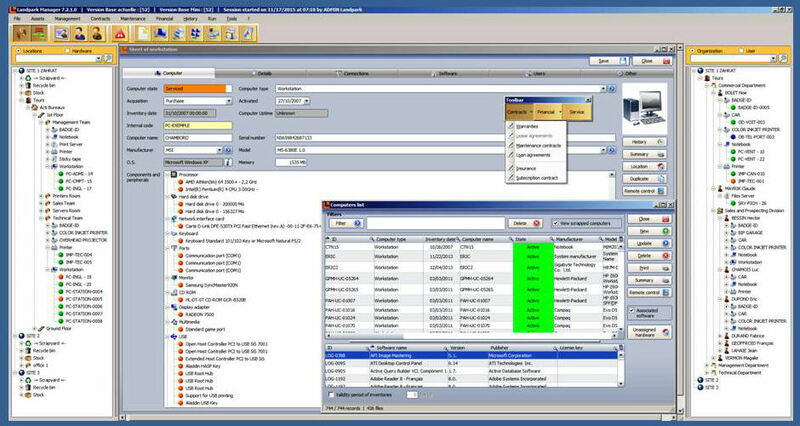 When opening a non-IT asset, the management toolbar makes it possible to edit its acquisition parameters, its guarantee contract, its maintenance contract, to open a ticket on this item, to calculate its depreciation method to allocate it to a budget line, to loan this item, etc. You can even give limited rights (to general services, for instance) to handle non-IT assets only. Tickets on your IT and non-IT assets. Print the ticket (detailed ticket report and history) / Export to Excel, Word, Html. Warnings on expired contracts, supply reorder, unlicensed or unwanted software and alerts sent by email. Warnings and alerts on unlicensed or unwanted software. 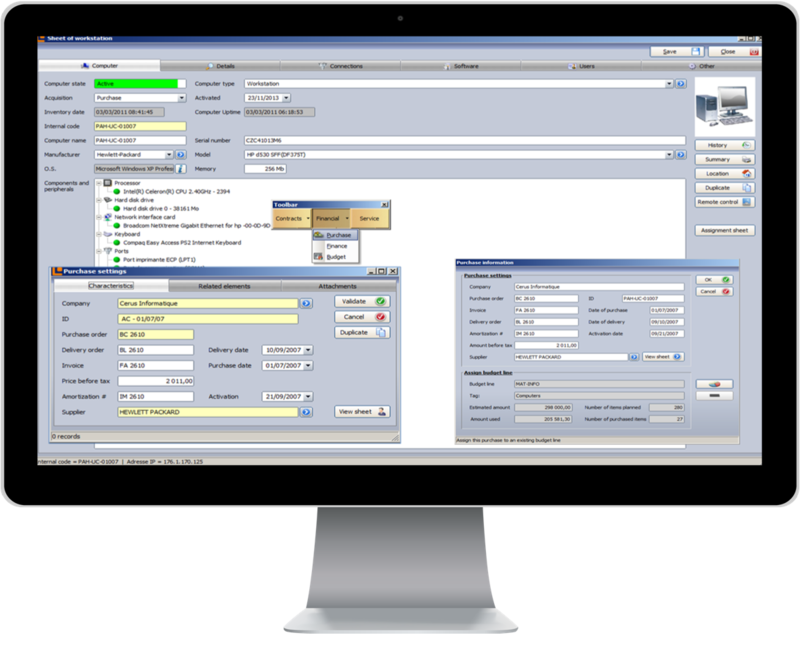 Controlling access to features, locations and organizations. 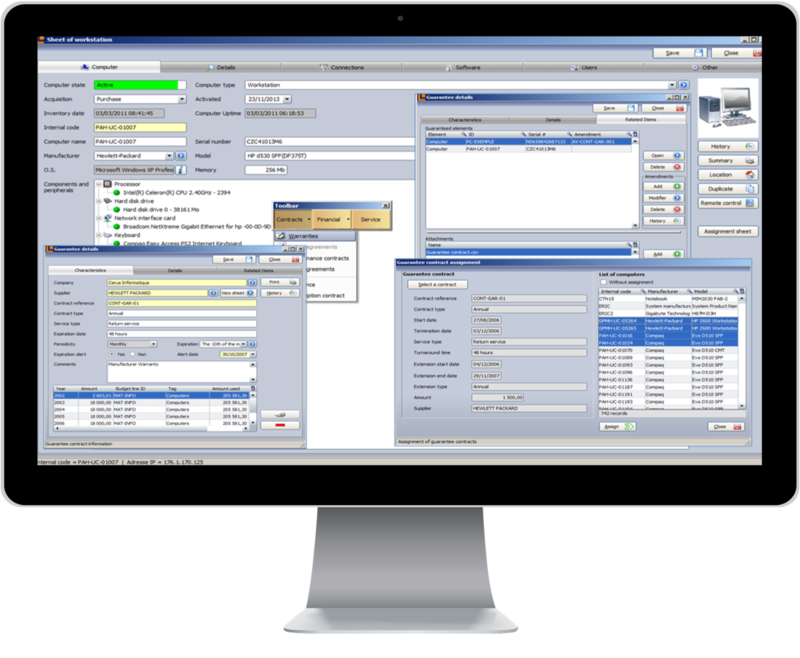 Managing your networks and network elements. Search by IP address and MAC address.